Caldera has confirmed support of the new MS Printing Solution’s Impres™ soft signage printer, which will be making its first appearance in the American market at SGIA 2017. It will be located on JK Group USA’s booth, #2369, during the show in New Orleans from 10th to 12th October. 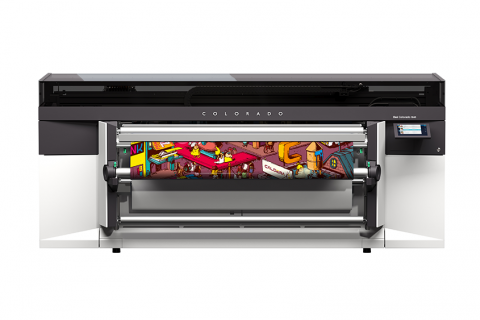 Caldera’s established GrandRIP+ software, which uses the latest version of the Adobe PDF Engine to guarantee fast file processing and excellent color handling, will be the select RIP solution bundled with the Impres™ Soft Signage System. Designed to offer a versatile, all-in-one engine for the production of increasingly popular textile display applications, MS Printing Solutions is addressing the market for lightweight, recyclable POP advertising, backlits, flags, banners, and exhibition and stadium graphics. The new product is an integrated digital printing system that combines MS Printing Solutions’ digital printer technology with Caldera software and specially formulated inks from JK Group. GrandRIP+ is Caldera’s medium to high production RIP product and incorporates several features designed to make printing simpler in textile workflows. Built-in color libraries, variable data printing, advanced cropping, tiling and nesting options and embedded ICC ink-level adjustment support tools are all valuable to future owners of the MS Printing Solutions Impres™ Soft Signage System. Its user-friendly interface also supports multiple devices, including cutting and finishing devices, giving owners confidence that they can expand their production machinery without compromising quality or turnaround. The Impres™ Soft Signage System printers are available in widths of 1.8m and 3.2m, and feature dual-channel, 2656-nozzle Kyocera Print Heads for precision printing even at high speeds, and a Qwizard Digital Front End that allow the management of the job queue to be embedded in the printer, so reducing printer idle time. Remote diagnostics allow users to access the machine and perform control-panel functions via a web interface that links them directly to the printer. The JK Group water-based dye-sublimation digital inks provide a wide color gamut and improved output, while meeting expectations for cost effectiveness and environmental sensitivity.